Many, many years ago, I moved to Montreal to live with my girlfriend (whom I would later marry). She got me hooked on Coronation Street. Being an internet nerd, I needed a place to obsess over my latest TV show. I found a number of blogs, like the UK based Coronation Street Weekly Updates and the Canada-based Downeast Corrie Blogger. But it was Corrie Canuck, back when it was on Blogspot, that I spent the most time on commenting. Eventually, that lead to an invitation from Glacia, the blog’s founder, to contribute updates and whatever tickled my fancy. Over the years, more and more of the contributors stopped posting as much but, for whatever reason, I kept it going. Eventually, I figured out that my ability and desire to watch two and a half hours of TV a week, then write about it, was on the wane. And to be honest, so is my interest in the show, at least in the obsessive detail it used to be. And that’s a shame because I actually think the show has come much more down to Earth with Stuart Blackburn at the helm. There aren’t the big crime stories they used to do and the stories are more human. I’ll probably stick with the show until Hayley’s departure (which is absolutely gripping) and the Christmas and New Year’s episodes but after that, I’ll probably follow the to’ing and fro’ing via the blogs and whenever I catch it on CBC. And I’ll tweet the odd thing now and again. I may still post the odd thing here and there but for now, I’m sorry to say the updates are coming to an end. I appreciate all you commenters and everything you’ve written here. I hope you understand my reasons for stepping back. Courtesy of Strombo, this is why Corrie doesn’t air on HBO. 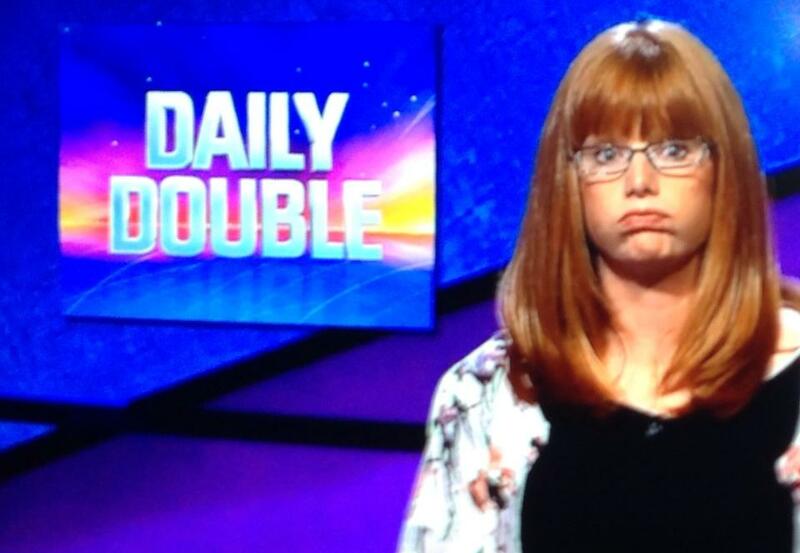 First of all, congratulations to Mare and her stellar turn on Jeopardy this week! Watch for her as a wild card in next week’s semi-finals. Is it me or does it seem like Liz Macdonald, who only just got back, has been behind the bar for ages? It was a very smooth transition and it all felt very natural. And if it means more Liz, Deirdre, and Eileen getting drunk and singing into vinegar cruets, I’m all for it. Oh, that Grace is a nasty one, isn’t she? This week, she stoked the Sally/Anna wars by nicking Sally’s change. Then she bullied Simon over Nick’s recovery until Nick himself lashed out at the kids. Owen and Sally have her number by everyone seems blind to it. My theory is that she has a horrible home life. After rowing with Roy and staying at Ty and Fizz’s, Hayley collapsed and went to hospital. She’ll be coming back home but is clear she intends to die there. Jenna has offered to pitch in and help Roy spruce up the apartment above the cafe. Speaking of Jenna, she broke up with Sophie this week. She and Lloyd commiserated over their failed relationships over a beer in the Rovers and Jenna had a good laugh over the idea of Lloyd and Liz being together. I do like Jenna and I hope they keep her around. I worry that if you can’t pair a character off with another character, they’re doomed, storyline-wise. Given that she broke up with the only person she could date on the Street, I’m not sure where that leaves her. Sally has told Tim she wants to slow things down and he’s just fine with that. Sophie says she just doesn’t see the attraction. There is a war brewing between Tina and Tracey. After demanding she sell back Elsie Tanner’s ring to Dennis (who pawned it for cash, hoping his bets would come in), Tracey demanded more money and, well, it ended with Tina throwing a rock through the window. Tracey tried to up the charges to include broken laptops (by breaking them herself) but it ended with Tina paying for the broken window. I imagine this is not the last we’ll see of these two. Todd’s coming up from London next week. After losing all his stuff from his market stall, Dev takes pity on Chesney and offers him a job managing the Greco. Sinead even sews manager on his apron. Julie and Brian are looking into fostering children. Well, Julie is. Brian is looking into new jobs. This will all end in, well, you know. Julie also had a talk with Sally about raising children and the commitment it requires. And that’s the line of the week, folks. Our own contributer Mare is on Jeopardy! Screenshot from the promo for the Teacher’s Tournament. Well, folks, I’m sorry to say it’s going to be another quick one this week ’cause having a kid in school, swimming, Beavers, and karate really cuts into one’s me time. I think the big event this week was Hayley’s bombshell that she wanted to end her life. After a joyous trip to Blackpool where she danced at the Tower Ballroom, Roy and Hayley returned to see their friend Jane who went from bubbly to a heavily sedated woman living in her old memories. Hayley told Roy she doesn’t want that, especially the memories which were particularly painful for her as a transgendered person. This led a big argument in which Roy accused Hayley of being a hypocrite. Roy reminded her that he once tried to take his life (remember Roy and Tracy and Amy?) and Hayley may change her mind as every day is the same. In the end, neither budged and Hayley went to stay with Fizz and Tyrone. Roy, sadly, while making good points, was sadly tone deaf to Hayley’s request. It’s interesting to introduce this to the storyline as the Quebec government is considering introducing end of life legislation and, obviously, it’s a sensitive issue for everyone. The christening was this week and Kylie found out about the DNA test so the christening was cut a little short. David is kicked out but Leanne doesn’t know about Kylie and Nick. Yet. Christmas? Yeah, it’ll be Christmas. Barry had an affair which, in Ireland, strips you of citizenship. That’s why he’s in England among the heathens. Ok, his wife kicked him out. Rita wants to go on holiday but Dennis doesn’t think he can afford so he pawns Elsie Tanner’s ring to Tracey Barlow at the pawn shop. Stella and Gloria are running the bistro while Nick recovers and because they need something to do before they leave the show. Liz Macdonald, who was Steve’s silent partner in the deal to buy the Rovers and now he and Michelle have their names above the door. So Steve is back owning the Rovers while Michelle took some time to come around to the idea. Norris is teaching Roy how to foxtrot in anticipation of a week away to Blackpool. They also went to a cancer support group where they met a woman who was very bubbly which Hayley found inspiring. But Roy found her cavalier attitude unsettling. But everyone faces their own mortality in their own way, I suppose. Best wishes to our very own contributor Mare, who leaves today for a wee jaunt to California where she’ll, I imagine, will eat some fish tacos, visit the laBrea tar pits, and find William Shatner’s star on the Walk of Fame. Oh, and appear as a contestant on Jeopardy! Goodluck Nare. May your run exceed that of Ken Jennings! Well, I’m back from New Brunswick after stuffing myself with turkey and, well, stuffing. I may never eat again. I’ve just gotten caught up on Corrie and I may have missed an episode or two but here’s what happened this week. Am I the only one who thought Nick was coming out of a coma with an ability to see the future of anyone he touches, a la Stephen King’s The Dead Zone? Let’s skip right to my favourite scene, shall we? No wonder I had nightmares about nuclear war in the 1980’s. Thanks, pop culture! Kylie is, well, passing bricks worried that David will find out (he already knows, of course) about the possibility that Lilly isn’t his. Eventually, Nick did start talking more and more long enough to have a conversation with David. He accuses David of trying to kill him and he wants a DNA test. There was a bit of odd business with Owen and some missing payments from a guy who owed him about £4,000. Problem is, the man was bankrupt (or claimed he was) and had no money to pay. So Owen stole his posh motorcycle from his posh house until the man coughed up the money. Owen dig some digging and found out the guy was a bit of a con artist or something. Anyway, he coughed up the money but Anna was furious, thinking this was going back to her days with Eddie. Although I think Eddie was a more of work avoider/benefits abuser and it was Len who was an outright criminal. Stella put the Rovers up for sale, deciding that it was time for a fresh start and Steve has been talking to her. Michelle quit the factory and has been pulling pints at the Rovers, even though she acknowledges it’s a step down. Ryan is stepping up, finally, to go be a full time club DJ in Ibiza. As he has substance abuse problems, living and working in the notoriously drug-free island should help him. So he’s gone then. We’ll see what he regenerates into when he comes back. Barry, Michelle’s dad, has popped up unexpectedly from Ireland. He claims his wife was off at a spa but really, it’s clear she chucked him out. There’s a new PA job at the factory. Sally, again, thinks she’s a shoe-in but it’s Eva who gets the job when she goes in to ask Peter some random question. He asked her to, I dunno, make a new cover sheet for the TPS reports. He saw that she had a wealth of experience from her temping days and, well, some other assets (OH WE ALL SAW WHERE YOUR EYES WERE, PETER BARLOW), he offered her the job. It is a hard rule of Corrie: Sally will never get that job. And she can’t go cry to Tim because he’s hiding from her, claiming he was off working in Birmingham. Brian hates his job and wants to quit. Julie wants to have babies, but cannot, and is considering fostering, on the advice of Rita. The conversation with her, Rita, and drunk Deirdre was hilarious. Hayley reconnected with Christian finally. Hayley, it turns out, is a grandparent now. She’d like to see her grandchildren but Christian is still weird and kind of bigoted toward her. They didn’t leave on good terms again. But this time, nobody got punched. Roy is going to take Hayley to Blackpool for a holiday to cheer her up. It was a quiet week on the cobbles as our residents took a breather from all the drama of last week’s arrest with Karl and waited for Nick to come out of his coma. Roy had his 60th birthday in the Rovers, complete with train cake and karaoke. But really the party was for Hayley, who splashed out on real silk blouse. “Would it be an imposition if I asked for a feel?” Mary asked Hayley. Hayley would like to get in touch with her son Christian and while she left a message for him, he hasn’t called back. Roy thinks it’s best to let it lie, given that Christian punched her last time. David would like to have a christening for baby Lilly but Audrey is dead set against it given that Nick is still in a coma. Jason and Eva have been growing closer ever since Karl’s arrest and then they got very close in Jason’s bed but, as usual on this show, nobody realized there was a fourth person in Eileen’s house until the next morning. My house is about the same size as Eileen’s and there is no way you wouldn’t hear someone coming up the stairs. Well, everyone promised to keep it secret but that wasn’t helped by Stella walking in on the two of them snogging in the back room of the pub. Awkward. Didn’t Leanne do the same thing with Danny and Jamie Baldwin? Dev certainly did with Deirdre and Tracy Barlow so the multigenerational dating is nothing new on the street. Michelle’s having a hard time with Peter-Come-Lately at the Faktry so she takes it out on Ryan and “Hannah-with-an-H” (“Well, how else would it be spelled?”). She even tells Ryan that his dreams of being a DJ are pipe dreams and that he should grow up and find a real job. Remember when Michelle was a singer? Oh, dear. Fizz and Tyrone decide to move in together at the Old Rectory and Ches and Sinead are happy for them, although I’m not sure how Ches and Sinead will afford rent. Does Sinead live there or with Beth? I’m not sure. Tyrone and Fizz will not be joined by pigeons, however, as Fizz put the kibosh on that little idea when Tyrone found an injured bird he named Beyoncé. Cool Sally’s attempts to be cool with Tim went up in smoke when he suggested a weekend away and she thinks “Paris!” and he thinks “Blackpool.” So he fakes a text and claims he’s got work in Birmingham or someplace. Next week, I won’t be available to do updates as I’ll be travelling to NB for the long weekend where I’ll be spending time with family.